Found her patrolling on her dragon to the east of Nifflevar. See screenshot for drops. I killed her earlier today. She has about 13,000 hp and hits for about 300 or so (I had 42.52% reduction via Frost Presence). She didn't seem to do anything of note. I also defeated her once before that, but the server went down. Both times, she dropped Abandoned Adventurer's Satchel and Soul-Sealed Belt. The Satchel contained about 23 gold and 20 Frostweave Cloth. Defeated her last week and as well as the stuff listed above, the bag and the random blue belt and acheivement, she also gave 20k rested experience for killing her. 26k rested exp (as a human), hit for ~500 ish (as a cloth wearer) and dropped the above loot. This rare patrols the patch of open plains around Nifflevar and Ivald's Ruin. I have not seen her wandering elsewhere yet. As the screenshot shows, she is a Vrykos on a Proto-drake, walking along the ground rather than in the air. Stumbled upon HER while questing. Soloed her as a 71 Prot-Warrior. No problem. Nice loot. 26 Gold and approx. 300 Gold for the belt. solo'd as a lvl 69 DK. No problems. Don't let the "elite" scare you. Even with a wild Shoveltusk on me I didn't even need to use a potion. Edit: Why on earth would you down-rate this? Extremely easy kill considering I was a prot Warrior just wandering through Fjord. If you see her, kill her. Oh and I got and . Not bad from one mob. Found at 75, 42 at 12:58 AM on Spirestone. She was traveling south very slowly and should be an easy solo for any class. Her corpse despawned in exactly 3 minutes. Happy hunting! Found her at 73,45 at 3:10pm on Firetree. Dropped 20g60s48c, 20 frostweave cloth, and the Squire version of the belt. Found her directly North of Nifflevar and she seemed to be headed that way. Found her twice now, once at around 71,45 and the other time at 71,54, both times she has dropped the Belt "Of the Beast", Gave a nice 30k Experience (15k bonus for rested) for killing her though ;) Nice easy rare. Just killed her tonight as I noticed her while passing by. Seemed to have a bit more HP than a normal mob but otherwise pretty easy. Dropped the belt and the satchel, which had 24 gold and a stack of frostweave cloth. Anyways, she seemed to be hugging the cliff/hill face. So if you were too far east she could easily be hidden from your view. Just killed her with my hunter alt (L72) at 74,56 Howling Fjord zone. Was pretty easy even with a Shoveltusk Stag added :) Gonna stalk the area with my Main to get Northern Exposure, too. Dropped the Soul-Sealed Belt of the Soldier (15.4% chance) (+34 Strength, +52 Stamina, +34 Critical Strike Rating) and Abandoned Adventurer's Satchel containing 15g 48s 9c, 20x Frostweave Cloth and 5x Crystallized Shadow. She can be found as far east as the area N. of Nifflevar, so you may want to broaden the scope of your search beyond the pins on the above map. Trackable as a humanoid, for all the hunters. Tested giant and dragonkin as well. Found her at 73.6, 49.5 walking along the ground. time 03:55. Soon as I was ready to attack her, the 80 elite Storm Giant came walking up behind me, so be wary of him. You'll know he's coming as the ground starts shaking. I chose this area to track one of the 3 rare elites for the Achievement award as there are a limited number of higher levels patrolling here. How long does she take to re spawn? She was heading in a southwesternly direction when I found her. Found at 74, 41, a bit south of the lift. Easy kill for a 68 Enhancement Shaman, I had to pop Ghost Wolves though. 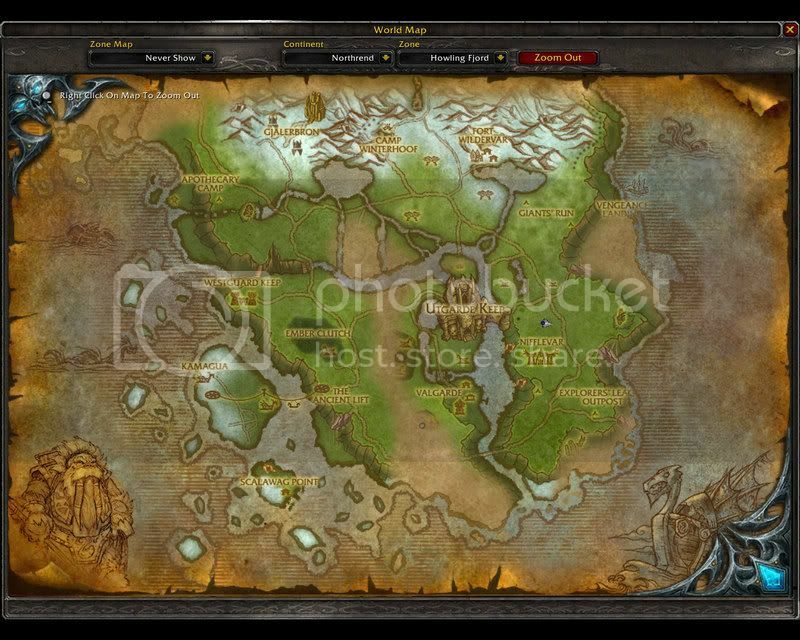 i was just walking arround howling fjord,saw it when was making a quest in the explorer's league area..killed it..was really really easy..
Found her at 71.70-47.76 at 1:18am server time on AzjolNerub. I suggest you get NPCScan. It went off within 30 yards of her. OK, I was able to solo her as a 69 Enhance shaman. I killed her three minutes before server restarts one Tuesday. I logged off for server restart exactly were I killed her. Five minutes after I logged out, I logged back in and low and behold, she was there again. She gave 15k XP both times I killed her along with two different superior quality items. The question I have is do rare spawns reset after server restarts or was this just a ridiculously lucky spawn timer? Every restart or server shutdown, they will automatically come up. very nice post about the server restart, mine was late on coming online today and i was getting desperate to be on before anyone else, thankfully, i knew about this before hand, and logged out in howling fjord, got all 3 there in 10 mins or so. She is usually found around explorers league outpost, she is the first rare I killed, about a week ago. Easily soloed as a 71 Tauren Hunter. Found her at 75,42 and got both of the listed items. My blue was "of the Physician". Just hit 70 on my shamy, had killed this rare on my paladin before, I havent even started questing in northrend yet, was headed to howling fjord to see if I could pick up any quest for Uk, thought what the heck, I'll go and see if this rare is up since it was close by, needed the "Norther Exposure" Achieve for her still, so I start patroling the area and sure enough I found the maiden, dropped down and was a really easy fight for me a 70 enhance shamy, had some BoA gear with dungeon outland gear. I half expected her to drop her mount, wishful thinking obviously... I guess we all have dreams! Found her today Wednesday 3/31/10 and slaughtered her. Found her 74.7, 55.7 2:28 Vek'nilash server time. if you're just going for the 'Northern Exposure' achievement, the Old Crystalbark in Coldarra is a more common spawn, ive killed him about 3 times now, never managed to find Vigdis. Killed her just now while flying to new agamand on my rogue, my npcscan went off and I mounted up and started looking for her at the last place I saw her, and what do ya know I found her. Gave about 18k (with boa gear) exp at lvl 70, 18g and a superior item. Found her just while flying along the road. She was walking with one of the Nifflevar guards, next to the road. 71.5, 52.8 Waited for guard to move ahead then pulled her to road. NPCscan shows her patrol area to be quite large: Between the northern end of the Explorers Outpost and the cliff that leads down to Vengeance Landing, and between Nifflevar and the coast. I found her patrolling on her drake (on the ground) directly east west from Ivald's Ruin at 78.8, 47.5. 7:24 PM on Silver Hand. Just killed her 11:26 server time on Shattered Hand server at location 74.0 45.5 walking on her drake she dropped the soul-sealed belt and 18 gold in the satchel. This was the first rare I killed for the achievement. I killed her a while back when I was still lvling my DK in that area. She was easy I dont think I went below 75% as a frost DK. Not too long before stumbling upon 女战士维格蒂丝, exactly 30 mins prior to finding her I microwave-peeped 乒乒国王 (see comment here). Server had undergone a rolling restart around the normally scheduled time earlier. NPCScan for the win! Time was 18:30 hrs (6:30PM Laughing Skull time), coords when found 71.5,54.0. (1 of 7 random enchants for this item). x20 霜纹布, x4 土之结晶, and 16G, 83s, 50c. *Edited again to add that 18 mins later I also downed 嗜血者比洛巴斯, at 18:48 hrs (6:48PM). Found her at (70,47) at 9:38am server on Laughing Skull, just a few minutes after killing King Ping. Found her sometime yesterday on Terenas. Wasn't paying too much attention to when it was, or where. Probably next to the Alliance elevator on the East side. I was searching all day for her. Pretty sure her spawn rate is is a couple hours at the very least. Since she patrols sort of a big area, you might miss her, even with _Npcscan. Had like 14k and dropped some Plate gear, and the bag had 15g and a stack of Frostweave. Killed Perobas sometime earlier, so I got plenty of Frostweave. Despite being mounted on a flying mount, she patrols on the ground. It has come to our attention that you're mistreating a fine specimen of a proto-drake. Anonymous sources suggests that you are having said drake walk around on all four despite of it having a pair of healthy, majestic and fully operational wings. "ownership of any drake demands a minimum amount of care, feeding and exercise to keep it healthy and well." Thus we ask of you, let your proto-drake fly around a bit, or we will be forced to take action. The drake-care division of D.E.T.H.A. Passed from PC to Mac just a couple of weeks ago. This website is exactly what I needed. Thanks for the multitude of tips and tricks here, they really help a lot. Thumbs up and keep up the good work! Found today around 1:10pm at 70.54,49.20 on the Nazjatar server... was killing shoveltusks for their meat for a recipe and my NPCScan popped... was super happy... been looking for her for a little while. Anyone know when this might show up on the US Nazgrel server? Thanks for any help on this. I was questing with them (the one you take the hawk to hunt turkeys) and stumbled upon him. I have found that when I quest in an area generally known to host these rare npcs that i find them without trying. Maybe it is a notable thing? Hope this helped. NPCscan alerted me at 1:29pm EST, slayed her at 68:47 Howling Fjord. First time I got to see my NPC scan actually do something, I was beginning to think it was crap. Went off at 11:23 EST on Illidan server in Howling Fjord 71:55 found her not too far away, considered not stopping because I only DLed NPCscan for rare animals to tame but figured it'd be a good chance to see if it actually works and how close the NPCs are when it goes off. As a Level 80 Paladin, while getting the "Explore Howling Fjord" achievement, dropped by the middle part of Nifflevar and Ivald's Ruin. While trying to solo kill a Storm Giant, I accidentally killed Vigdis the War Maiden, without me knowing until I got the "Northern Exposure" achievement. I think this NPC's name may be a reference to Tom Clancy's "Red Storm Rising." There is a young woman named Vigdis in the book who is rescued, in wartime, by an American airman and some marines. Her part of the book is in Iceland, tho, so it may just be a name from a cold northern region that Blizz picked. Killed at 73.0, 61.4 today. Dropped 灵魂封印腰带...of the Foreseer and 被遗弃的冒险者背包 containing 霜纹布 x20 and 15g 89s 71c. I sat a , as that looked like a good spot to cover the most area of her patrol path while I went afk. NPC_scan went off as she spawned on top of me. Killed on a Friday morning 6:55 EDT at . Someone else commented speculating on the name; it's a not-uncommon Nordic name. Iceland's first female president (first democratically elected president anywhere) was named Vigdís Finnbogadóttir.